Perky Jerky…say wha? | Do the twisted. You think you’ve seen it all at 26 years old (insert sarcasm here) and then you come across these guys. Even though caffeinated beef jerky sounds incredibly disturbing, I can’t help but be intrigued by Perky Jerky. Described as having outstanding flavor and a powerful jolt, it is the world’s first all natural caffeinated meat snack. Despite its unusual nature, Perky Jerky does have a stellar brand. So all in all, A+ on the curiosity scale. Now, if I may say, eating beef jerky always reminds me of eating a carcass in the safari. I personally never have, but National Geographic has shown me around the block. So it’s easy to imagine those eating Perky Jerky to resemble lions on speed. But I hate to see animals on drugs, so instead I’ll imagine people replacing coffee with Perky Jerky. Perhaps offering it to clients before a meeting progresses or gnawing on it when the afternoon snooze fairy dumps a mattress on your desk. 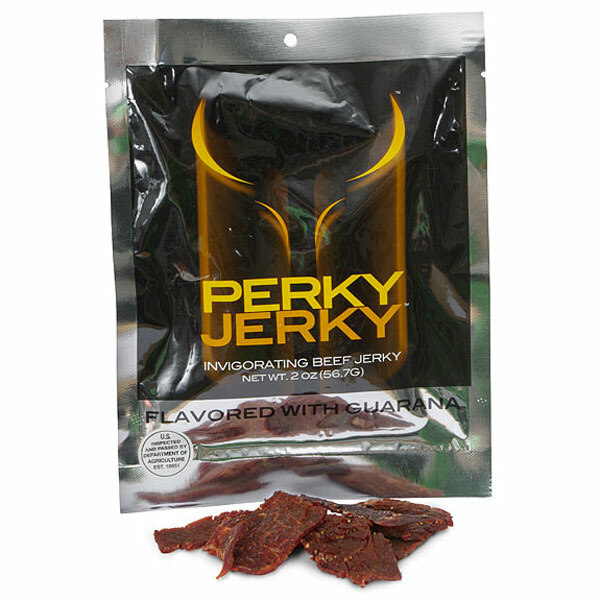 Perky Jerky could even be the new Red Bull. People can tear it up before they hit the clubs. It’s not wise to go out on an empty stomach anyway. So they’ll get a snack and a pick me up all in one. Which makes me want to ask one question; who wants to grab a bag and have a dance party? Thank you for sharing excellent informations. Your web-site is so cool. I am impressed by the details that you¡¦ve on this website. It reveals how nicely you perceive this subject. Bookmarked this web page, will come back for more articles. You, my pal, ROCK! I found simply the info I already searched all over the place and just couldn’t come across. What a great site.